To get teenagers to get involved with their own communities. Paint the World is an initiative that was started by Cecilia Coppye & Lika Torikashvili, with the aim of bringing some colour to the lives of people in need. Through song, dance, games and other fun activities, Paint the World has helped to make a difference in the lives of many people around the world. The first leg of Paint the World took place across Europe, in France, Belgium and The Netherlands. In Paris, Cecilia, Lika and a group of nine volunteers visited a care home where the volunteers spent time with elderly residents. 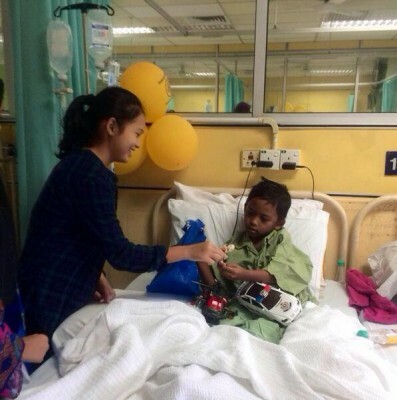 Paint the World at the Children's Cancer Ward in Kuala Lumpur Hospital. In Belgium, they visited Brussels, where they volunteered at ‘Povereto’, a homeless shelter that offers free food and accommodation to any person in need. Then, they moved on to Antwerp, where they worked at a refugee camp. They brought balloons and sweets for the children, and brightened up their days with sing-a-longs and dancing. In The Netherlands, the group visited UWC Maastricht to talk about the Paint the World project. They wanted to motivate others to volunteer and start up their own branches around the world. Many students showed interest, and were eager to offer up their own fun activities to people in need. The second leg of Paint The World brought the group to Malaysia, where they visited Kuala Lumpur, Miri and Kuching. Over the course of a month, the group hosted activities in orphanages, hospitals and care homes. While in Malaysia, the Paint the World project attracted plenty of attention, as the organisers met with country’s Minister of Sports and Youth as well as the head of Kuala Lumpur University. Students from across the country showed their own interest in Paint the World, and over 800 individuals registered as volunteers for the project! "We could communicate without any language boundaries. Thats a very interesting fact about our movement - nothing matters as long as you share love and are friendly"